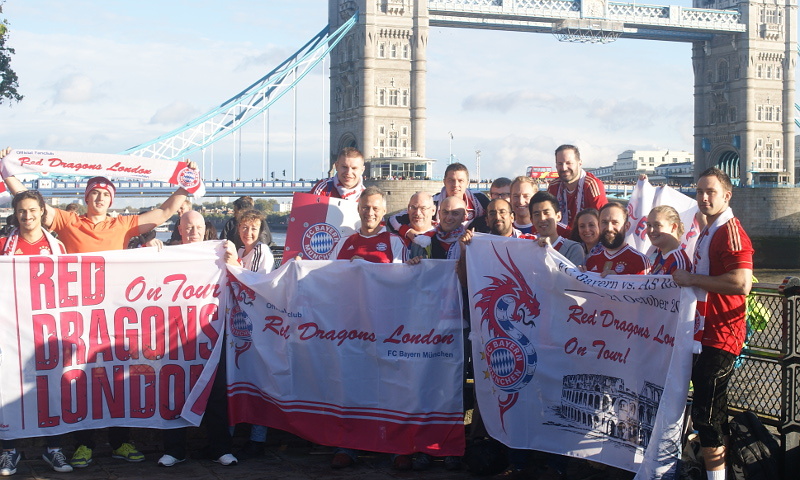 On the Wednesday before the home game against Hannover 96 in early October 2014, the Red Dragons London were approached by FC Bayern to apply for a fan club feature in the stadium magazine – the match programme issued at every weekend fixture at the Allianz Arena. 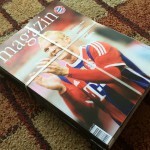 Every month the Bayern Magazin features one of FC Bayern’s many fan clubs, and given that the Dragons were fairly new to the game having been running for just over a year we found it an immense privilege just to be asked. 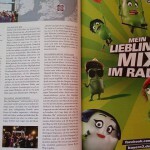 Naturally, we leaped into this project with enthusiasm! 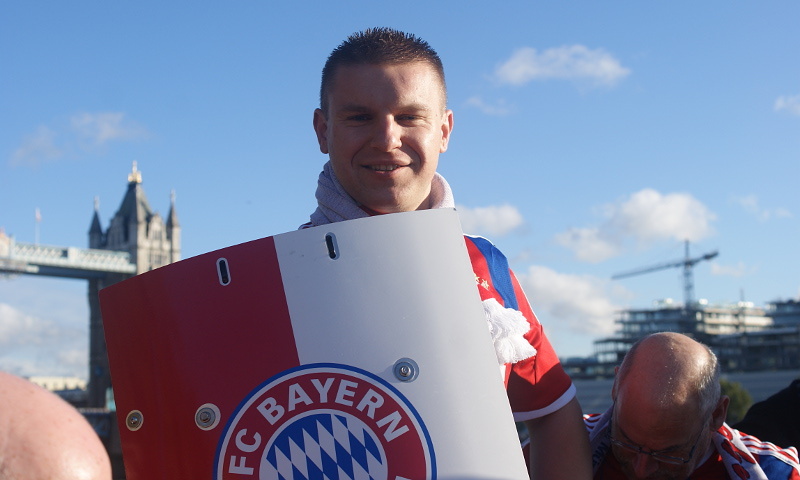 As we had to present the article and the photographs early the following week, the board quickly got onto Facebook and mobilise the troops – setting up a photoshoot to take place on the day of the H96 game. While the planning was nigh on perfect with a number of Red Dragons responding positively to the call, the combination of the weather and problems with the public transport network resulted in changes being made on the fly. 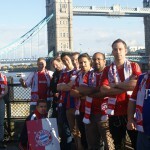 Naturally, the board quickly created a “Plan B”. 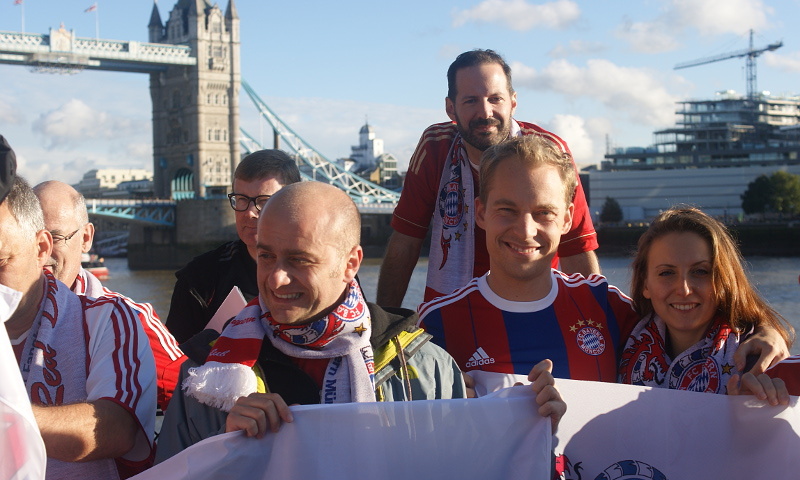 With the plans for the pre-match photoshoot by Tower Bridge and trip back to Old Street to watch the match scuppered, we were able with the help of Nadja and Mara to get all of the decorations to our second lair at the Bavarian Beerhouse in Tower Hill. 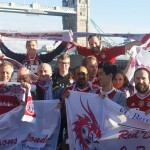 With everything sorted, around twenty-five Dragons gathered to see FC Bayern chalk up four goals as H96 were summarily brushed aside. After the earlier problems things finally started to fall into place. 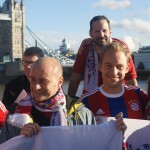 With a group in an excellent mood after the match, the sun also came out just in time for the photo and video shoot. 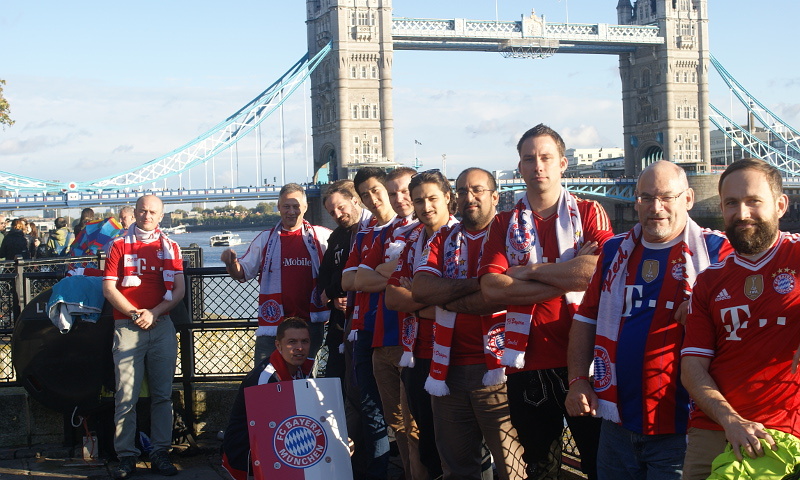 Somehow we managed to hold off the hordes of tourists to take over an excellent spot for the photographs, and at the same time regale our audience with a number of FC Bayern songs. 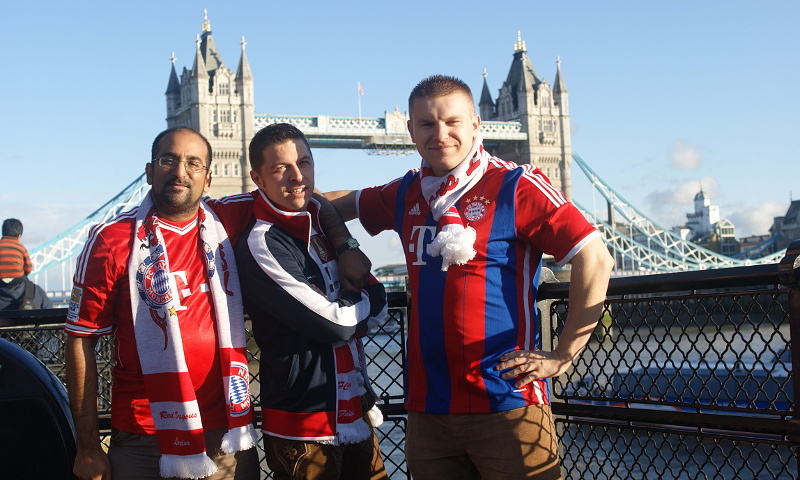 It was like the Südkurve on the bank of the Thames! 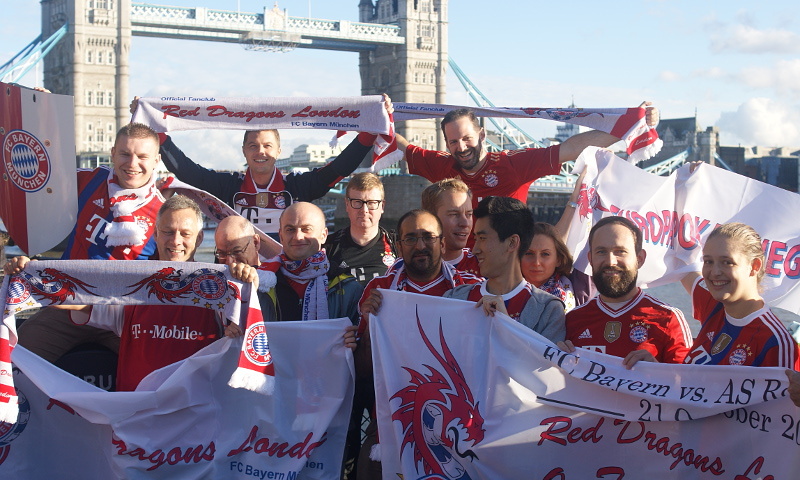 Some Dragons then headed off to London’s own Oktoberfest to carry on the celebrations, but the rest of the weekend saw chairman Thorsten write up the article and gather the photographs with help from Rick and Markus – and by Monday everything was sent across to FC Bayern. Then, it was a matter of sitting back and waiting. 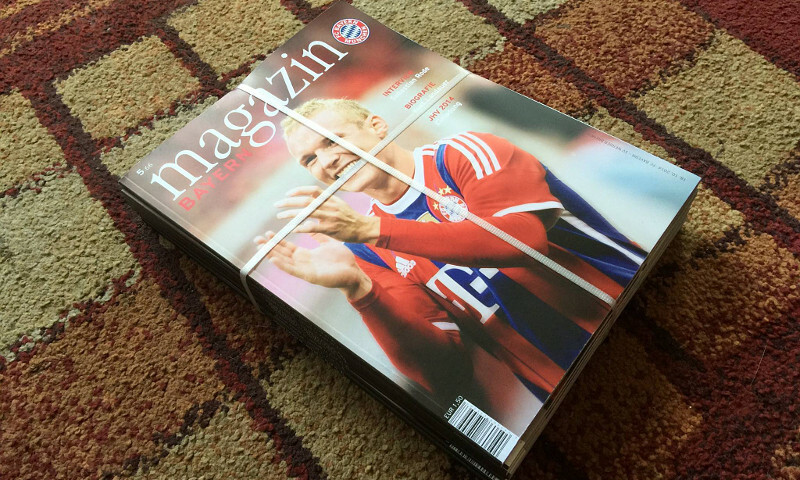 With other fan clubs also submitting similar pieces, would we make the next issue? 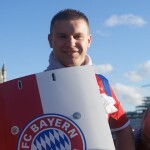 These questions were answered emphatically on the Friday before the game against Werder Bremen, when Thorsten shared the first scan of the article. 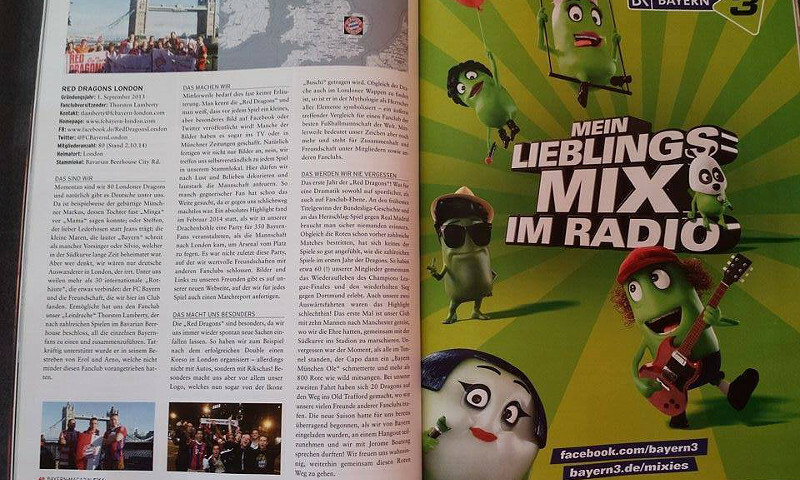 There we were, the Red Dragons London, in the pages of the Bayern Magazin! 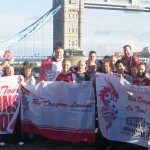 Naturally, orders were placed with travelling Dragon Terry, who would buy a large bundle to bring back home!